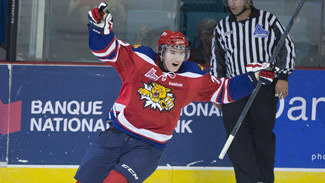 Moncton Wildcats left wing Ivan Barbashev, the only "A"-rated prospect on NHL Central Scouting's preliminary list of the top 2014 NHL Draft-eligible players from the Quebec Major Junior Hockey League, will return to the lineup Friday at the Saint John Sea Dogs after sitting out the previous five games with a lower-body injury. Wildcats coach Darren Rumble said he intends to give Barbashev between 15 and 20 minutes of ice time in his anticipated return. The coach said the 6-foot-1, 185-pound left wing has looked good in practice the last few days. "I'll ease him in, but I'm not a big believer in [easing a player in]," Rumble said. "If you're cleared to play, you're cleared to play. Now I'm not going to give him 30 minutes but I think he'll get a regular shift and power-play time, so we'll try and get him no more than 20 minutes; about to the 15-minute mark." Barbashev was injured while taking a faceoff in a game against Saint John on Oct. 16 when he attempted to kick the puck but instead caught his skate in a rut. At the time of his injury Barbashev led the team in points (18) and was tied for the team lead in goals (seven) and assists (11). He's averaging 1.29 points per game. "We've had trouble scoring goals even though we've been outplaying teams the last two or three games by a significant margin," Rumble said. "Hopefully Ivan will help in that department." Moncton lost four of five games without Barbashev, including a 2-1 loss to the Shawinigan Cataractes on Oct. 26 and a 3-2 loss to the Sherbrooke Phoenix the following night.